​Finally, the shift in wind direction arrives to clear our passage and we escape! 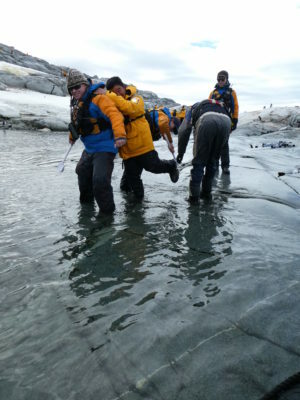 It takes six days for the ship to be able to leave Prince Gustav Channel and the James Ross Island environment. Sea ice blocks all five possible avenues to the Antarctic Sound, the body of water that will take us to the Western Antarctic Peninsula, our overdue destination. The ship pitches and rolls through the open Sound, an all-day journey, but I am looking forward to different landscape and wildlife on the western side. On the way, we’re called to the deck to see dozens of orca, fin, and humpback whales in a krill feeding-frenzy all around the vessel. We can see no land (or ice) anywhere. It is snowing on the first morning of our arrival on the west side. 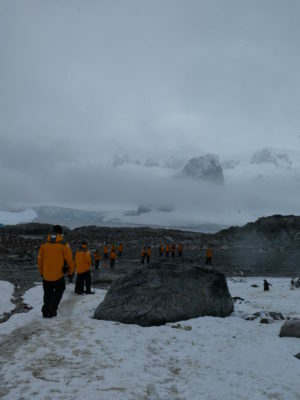 The zodiacs take us to Cuverville Island, the home of the largest Gentoo penguin colony (over 9,000 breeding pairs) in Antarctica. There to welcome us when we step on land are thousands of Gentoos as well as fur and Weddell seals, cormorants, skuas, and Antarctic terns, which we see frolicking on the rock-strewn ground, in the snow and in the water. Also greeting us is the now-familiar pungent aroma of penguin poop. The landscape is indeed different from what we saw of the east side. The glacier-covered mountains rise precipitously from water’s edge creating canyons that dwarf our ten-passenger boats as we make our way around the island admiring the views and the leopard seal that playfully glides among the zodiacs, around and under our boat. Later in the day, we set foot on Useful Island, so named because the expedition that discovered it found it useful for cartographic reasons. 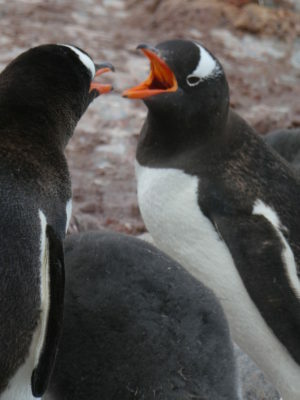 Here we see more Gentoo penguins and some Chinstrap penguins. These little guys look like they’re wearing helmets with the straps too tight under their chins. And the amount of poop- unbelievable! 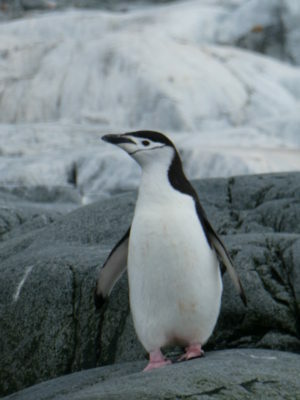 It is red because the penguin diet consists largely of krill, an orange-colored crustacean. It is everywhere and, mixed with the melting snow, makes one helluva soupy mess. The guides stand by the zodiacs with scrub brushes to remove it from our boots before we sully the boats with it. And the smell follows us everywhere. So making up for time lost, we are offered a third zodiac cruise the same day. Having just finished a shower in hope of purging myself of the penguin poop aroma, I am not entirely up for putting on the awful-smelling outer gear yet again. I consider going to the yoga studio to do some stretching as a more attractive alternative. But wait, I think. I am in Antarctica. I can do yoga in Oakland. So I go, a very good decision as it turns out. The evening is quiet, the sunset scarlet and tangerine, bathing the water in soft shades of pink and peach. The silence is broken by the sound of heavy breathing, plumes of mist all around the small boat. 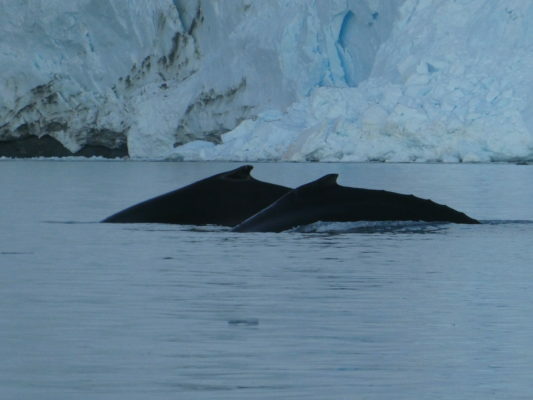 The humpbacks are lunge-feeding krill. Their cavernous mouths open above the surface. Flippers, fins and flukes are everywhere. For an hour we are transfixed by their display of hunger and power. And then daylight gone, nature’s show at an end, we return to the ship feeling elated. And on our final night of this outstanding voyage, before making the two day journey through the Drake Passage back to Ushuaia, I go up to the top deck after midnight to view the stars. The sky still has some brightness (is it the end of sunset or the beginning of sunrise?) and is a stunning finish to a remarkable expedition. You really go to the ends of the earth to have an adventure. Fabulous! Noone else talks about the penguin poop! I guess it’s the price to pay to see such cuteness! Really enjoying your postcards…your writing is so descriptive I can imagine being there.